We all know someone (or have personally been) in a toxic relationship. A controlling, happiness-destroying relationship. Yet it's still hard to let go. Instead, it's a cycle of breaking up and getting back together. 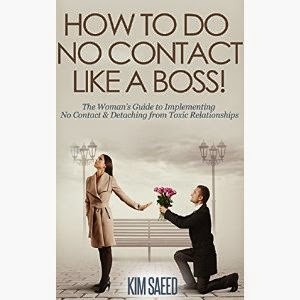 Kim Saeed How to Do No Contact Like a Boss!" is a comprehensive guide, aimed at women, to ending a toxic relationship and getting that toxic person out of your life. "How to Do No Contact Like a Boss!" covers everything from identifying someone who is narcissistic to formulating a plan for breaking it off to how to deal with getting lured back into the relationship. My favorite section is about healing from a toxic relationship. What really sets this book apart from other books on the topic is that it gives you a specific plan that is easy to follow. I would recommend this book to anyone who wants to turn a new leaf and move toward a better future!